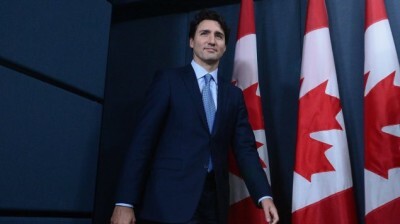 Canada’s PM Trudeau displayed all the sycophancy of a stalwart U.S. ally in his response concerning actions towards Russia – or, as with former PM Harper, it could be actually viewed as front-running for the empire in order to create momentum and be part of the team. He is strongly supported by the media as there has been little if any news recently about the “bloody actions” of the U.S. military actions in Mosul. Hundreds of civilian deaths – including many children, “beautiful babies,” and heavy destruction of infrastructure are occurring as the city is slowly retaken from ISIS. The media could also serve up reminders about Secretary of State Albright’s comments that five hundred thousand dead Iraqi children is worth the price of beating Saddam Hussein. There are many recent reports of severe health related problems – deformities and cancers – with the children of Fallujah, exposed to the toxic effects of depleted uranium munitions used on the city by U.S. forces. Yes children are precious, “beautiful babies”, but that has yet to stop the U.S. military, assisted by Canada, in killing hundreds of thousands globally since WW II. After one unverified chemical attack – unverified for who actually did it and how it was done, along with verification of the type of chemical – the U.S. and its puppet governments scream “bloody murder.” Double standards abound. But hey, you argue, this was a weapon of mass destruction, a chemical weapon. I use Churchill to display all the hypocrisy and double standards that Canada has inherited in its role as predominantly white nation within the British imperial tradition of ruthlessly bombing the ‘other’ – and as such uses Churchill in many of their pro-war quotations. As for Russia, that inheritance includes attacks by the British in northern Russia, using poison gas (diphenylchlorarsine) against the Russian revolutionaries after WW I. Which comes around to the current situation again. What you do speaks so loud I can’t hear what you say. As usual, Trudeau did his ‘Liberal’ thing, saying “we know there is no military solution,” only that the situation be solved being “thoughtful, diplomatic, firm and multifaceted as we move forward.” Sounds great, but with the U.S. as our ‘firm, diplomatic, thoughtful’ ally, the only actions will be military. The world need not be fooled – the current Liberal government under Trudeau is about as liberal as the previous Conservative government under Harper, a dynamic duo extolling the virtues of military actions – except that the Liberals use nicer words, and offer common platitudes about dialogue and diplomacy. Finally, where has your campaign rhetoric gone, about looking for the roots of the problem? Or is the mirror too cracked for you to see yourself? Yes children are precious, “beautiful babies”, but that has yet to stop the U.S. military, assisted by Canada, in killing hundreds of thousands globally since WW II. More sanctions – the U.S.’ second favourite form of warfare – and support for the bloodthirsty industrial military complex will not help solve the problems of Syria and the greater Middle East.